Launched in September of 2011, Casey's Pizza was the Bay Area's first pizza truck. The custom rig features a 700F Marsal deck oven with a 2" firebrick hearth. We create crispy, thin crust Neapolitan pies inspired by the pizzerias of old New York (such as Pepe's, DiFara, Lombardi's, Grimaldi's). Our pies are each handcrafted and made to order. We source only the tastiest local ingredients and make our dough from scratch with organic flours. 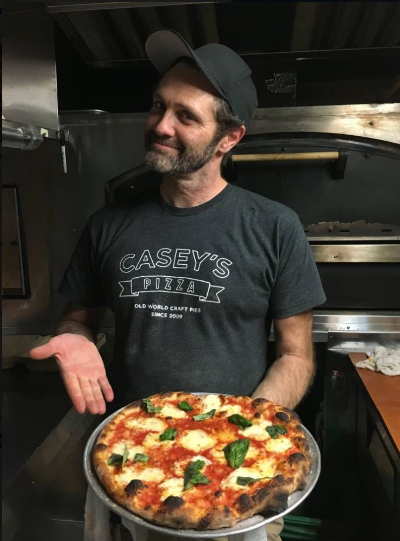 Casey Crynes arrived in Bay Area back in 2006 and began a search for pizza similar to what he grew up eating on the East Coast. After many pies, a pizzeria internship at Rotten City Pizza in Emeryville, and shooting a short documentary on New York Style in the East Bay, he got close to his old country pies. Casey initially set up shop as an underground street vendor at discreet locations in the Mission and SOMA. Making pies on a modified 800F Weber worked well, you could bake a pie in 2 minutes. In the spring of 2011 he became a vendor at the Upper Haight Farmers' Market where he sold his first street legal slice. Soon after he began his plan to build SF's first pizza truck, and then years later, a brick and mortar spot in Mission Bay. Recently opened in September 2017, Casey's Pizza now has a full on brick and mortar location at 1170 4th Street in Mission Bay. Come dine in or take out with a full menu of salads, hot pie, craft beer, wine, and dessert. The truck is currently only available for private events. Please drop us a line with catering inquiries. Truck lunch service in the FIDI and Hayes Valley will be back soon. We are always excited to hear from experienced servers, pizza cooks, and other food service pros looking to join our team. Send us an email.